"Innovative career & communication strategies for Technology Executives - accelerating exceptional career and business success." With over a decade of experience in the careers industry, Kim Batson is known as an industry leader and expert in the field of personal branding. An international speaker and writer on the topic of personal branding, Kim assists Technology Executives and Managers in identifying and articulating their own personal brand. Having developed a unique 6-step process and clear methodology for creating a personal brand, Kim consistently receives rave reviews from her clients globally for its effectiveness. In addition to being a Certified Personal Branding Strategist, Kim is also a Certified Leadership & Talent Management Coach, Certified Career Management Coach and Certified Job Search Trainer, Certified 360 REACH Analyst. 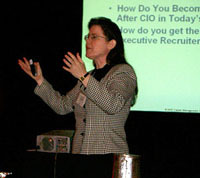 Kim was chosen by NETSHARE.com, the leading site for Executive Job Search and Career Management, according to Forbes &	Fortune	magazines, as a Coach for IT Executives. She is a member of the International Coach Federation, Career Management Alliance, National Resume Writers Association, Christian Coaches Network, and Women In Technology International. A member of the Advance Team of REACH Branding Strategists, Kim is one of the first Certified Personal Branding Strategists in the world to be personally trained and qualified by the global leader on the subject of personal branding, William Arruda. Her style is energetic and results-driven. A dynamic communicator, Kim is passionate about powerfully articulating one's unique promise of value to gain extraordinary results. Are you ready to schedule your complimentary session with Kim?